This form is drafted for use when a tenant is reducing its space, which requires a modification of the rent and proportionate share language in the lease. In this case, the tenant is also extending the term for the reduced premises. 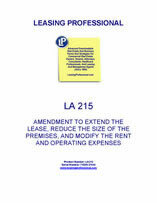 THIS LEASE AMENDMENT (the “Amendment”), is made and entered into this _____ day of ________, by and between COMMERCIAL PROPERTY LANDLORD, INC., hereinafter referred to as "Landlord," and ACCEPTABLE TENANT, INC., hereinafter referred to as "Tenant," and modifies that certain lease executed between Landlord and Tenant on ___________ (the “Lease”). A. Landlord and Tenant entered into a certain Lease Agreement dated ___________ and executed and effective as of ___________ (the "Lease"), which Lease is scheduled to expire on _________________, relating to the lease of ________ rentable square feet more or less ("Original Premises") in the building commonly known as the COMMERCIAL OFFICE CENTER, ______________________ ("Building"). B. Landlord and Tenant desire to modify the Lease to extend the Term, provide for a reduction in leased space and otherwise modify certain terms of the Lease as hereinafter set forth. 1. TERM. Paragraph 1.4 of the Lease is hereby deleted in its entirety and replaced with the following: The Lease shall be renewed and the Term Extended for a period of twenty-nine (29) months beginning on ________________ (the "Extended Term"). All terms and conditions of the Lease in effect as of _______________ shall remain in effect during the Extended Term, except as hereinafter provided. 2. COMMENCEMENT DATE. Paragraph 1.5 of the Lease is hereby deleted in its entirety and replaced with the following: Commencement Date: ____________. 3. TERMINATION DATE. Paragraph 1.6 of the Lease is hereby deleted in its entirety and replaced with the following: Termination Date: ___________. The Tenant has the option to cancel this Lease prior to the Termination Date provided the Tenant gives the Landlord ________________ (___) days prior written notice. In the event the Tenant cancels the Lease before the Termination Date, the Tenant agrees to pay to the Landlord a payment equal to the unamortized cost of carpeting and painting the __th Floor. 4. BASE RENT. Paragraph 1.7 of the Lease is hereby deleted in its entirety and replaced with the following: Base Rent: $________ per square foot, $_________ per annum, $_________ per month. Rentable Area of Demised Premises ("Net Rentable Area"): _________ square feet more or less. 6. TENANT IMPROVEMENT ALLOWANCE. Paragraph _______ of the Lease is hereby deleted in its entirety and replaced with the following: Landlord agrees to carpet and paint the __th Floor.